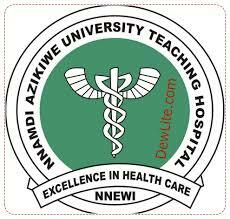 Application are invited from suitably qualified candidates for admission into the School of Health Information Management, Nnamdi Azikiwe University Teaching Hospital, Nnewi, Anambra State for the 2017/2018 academic session. The program is in two parts. Part I and part II leading to the award of the National and Higher National Diploma of the Health Records Officers Registration Board of Nigeria respectively. A. Prospective 2017 UTME candidates with a minimum score of 180. In addition to the specific entry requirements for the ND programe for the health information management, the candidate for the HND programme must meet the following entry requirements for the HND programme. 8. Evidence of completion of one year relevant work experience in an accredited health institution approved by the Board. 9. Candidate with a pass (gap 2.00 – 2.49) at the ND level with two (2) or more years post-ND cognate work experience may be considered for admission into HND program. Any student admitted to any part of the programme for the first time for either the ND or HND will be required to matriculate at a formal ceremony and sign the register of matriculating student. Selection of candidates for the part I and II programme will be based on screening of JAMB result, WAEC/NECO/GCE and ND/HT, and any other relevant certificate to determin qualification for admission. The course is residential and compulsory for all students. 10. Request for application forms, should be sent with two self addressed and stamped envelopes to the Chief Medical Director, Nnamdi Azikiwe University Teaching Hospital, Nnewi and marked “attention of the coordinator, School of Health Information Management” with a non refundable application fee of N5, 000 (five thousand naira only) in certified bank draft payable to Nnamdi Azikiwe University Teaching Hospital, nnewi. 11. Candidate can also pay with certified bank draft or cash at the revenue collection center and duly receipted to collect the admission form. 12. The closing date for the sale of and submission of the part I and Part II preogramm forms is Friday 1st September, 2017. 13. Applications duly completed must be return to the coordinator on or before closing date. 15. Prospective candidates should come along with the ORIGINAL COPIES of their certificates for the interview.